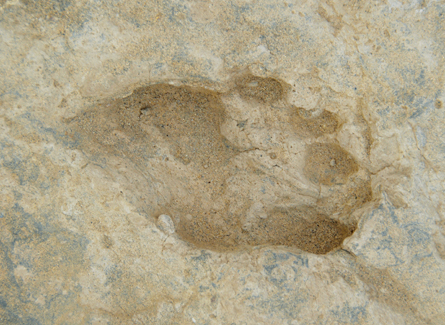 A new analysis of 1.5-million-year-old fossil footprints uncovered at Kenya’s Ileret site suggests that they were made by a human ancestor with a gait different than that of modern humans.Courtesy of Matthew Bennett/Bournemouth Univ. “We can infer that the ancient Ileret individuals had a normal, functional gait, but they may have walked differently than we do,” Hatala said. For now, it’s uncertain just how these hominids walked and whether they belonged to Homo erectus, a possibly direct human ancestor, or to the side-branch species Paranthropus boisei. Technologies that produce 3D images of footprints preserved in different types of soil should soon yield insights into how hominids walked at Ileret and at other ancient sites, commented graduate student Sarita Morse of the University of Liverpool in England. Hatala and his colleagues compared five preserved Ileret footprints to those of 38 Daasanach herders in Kenya, none of whom wear shoes. Participants walked across a pressure pad before walking across moistened Ileret soil that approximated the conditions under which the ancient footprints were made. Pressure measurements at 10 spots across the bottom of the foot closely corresponded to depth measurements at the same spots on volunteers’ footprints. Disparities in depth measurements between Daasanach and ancient Ileret footprints signaled that the hominids walked unlike people today do. Other comparisons to Daasanach footprints indicated that two sets of Ileret tracks were made by individuals who were walking, not running, and who stood about 5 feet, 6 inches tall and weighed 110 pounds. That’s in the general size range of Daasanach people today. Meanwhile, new analyses of foot bones from two partial Australopithecus sediba skeletons, excavated in South Africa (SN: 5/8/10, p. 14), show that this hominid had an upwardly curved, mobile mid-foot built for tree-climbing, reported anthropologist Jeremy DeSilva of Boston University. Previous work had identified thin, apelike heels combined with humanlike ankles and arches in these fossil skeletons.